Here we are with Jaipur Travel Guide describing about the Jaipur Local Tourist attractions, where to stay in Jaipur, hotels and restaurants in Jaipur, how to reach Jaipur, best time to visit Jaipur and tips for tourists going to visit Jaipur. 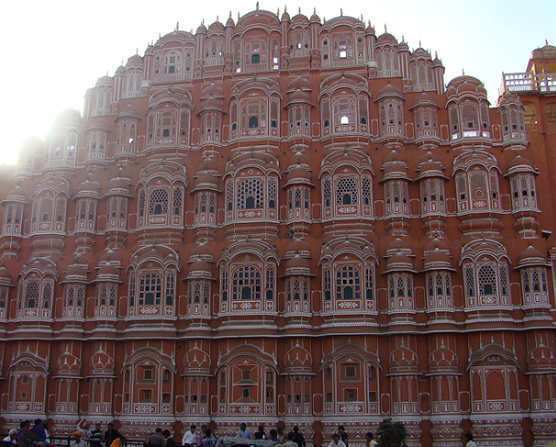 Jaipur also known as the Pink city of India is the capital of Indian state Rajasthan. It was founded on 18 November 1727 by Maharaja Jai Singh II after whom the city is named. Jaipur is a popular tourist destination in India that attracts lots of tourists not from India only but across the world because of its rich and heritage culture. Many of us wonder why Jaipur called The Pink city of India it is because every building within the boundaries of Jaipur is painted terracotta pink as this color historically represents welcoming and hospitality. This color is so that it is enforced under local law in 1877 still remains in effect today also. Architect Vidyadhar Bhattacharya designed the Jaipur basis on the principles of Vastu shastra and Shilpa Shastra and it took four years to complete the major roads, offices and palaces. Jaipur is very popular tourist destination in India forming a part of the Golden Triangle. Located at a distance of 260 km from the Indian capital New Delhi makes it a popular weekend destination for Delhiites (residents of Delhi) and other neighboring states. Jaipur temperature is semi-arid type remains comparatively on the higher end all around the year. The summer in Jaipur is very hot starts from April and continues till July. Jaipur receives over 650 mm of rainfall each year in the months of August and September. The best time to visit Jaipur is from October to February as the weather remains pleasant and the city observes winters. Though you can experience dense cover of fog in mornings and evenings but afternoons are perfect to enjoy the city and attractions nearby. There are lots of forts and museum in Jaipur. Here we are with some major attractions in Jaipur that one can visit during his/her visit to Pink city. 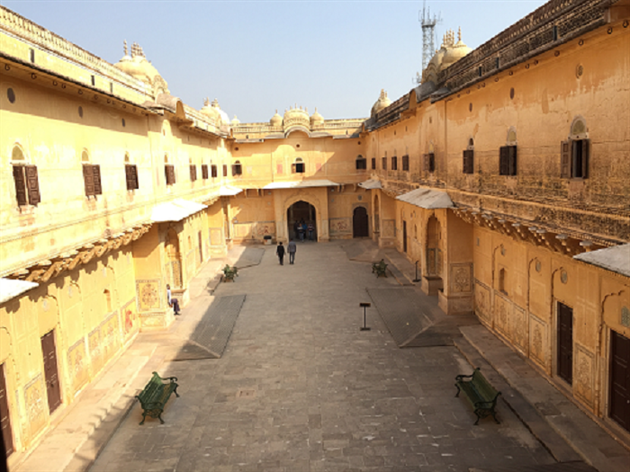 City Palace is situated in the middle of the Jaipur city occupies about one-seventh of the old city area is a great example of Rajput and Mughal architecture. Chandra Mahal, Mubarak Mahal, Mukut Mahal, Maharani's Palace, Shri Govind Dev Temple and the City Palace Museum all are the part of City palace and opened for visitors. You can see the world's largest sterling silver vessels named as Gangajelies in Diwan-I-Khas a marble floored chamber is a private audience hall of the Maharajas. The 'Diwan-E-Aam' (Sabha Niwas) or the 'Hall of Public Audience' is an art gallery where you can see the rare ancient handwritten original manuscripts of Hindu scriptures and Golden throne that was the seat of the Maharaja during a public audience. Popularly known as 'Palace Of The Winds' is a very famous tourist spot in Jaipur was built in the 18th century by the orders of King Sawai Pratap Singh. It has 953 windows or 'Jharokhas' to facilitate the royal women and provide them a view of the everyday life events of the city through the windows, as they are not permitted to appear in public. Sawai Pratap Singh was the follower of Lord Krishna that's the reason Hawa Mahal palace's construction resembles the lord's Krishna crown. Galtaji Temple is located in the Aravalli hills only 10km away from Jaipur. The temple complex has natural freshwater springs and 7 holy 'kunds' or water tanks. Among these 7 water tank, the 'Galta Kund' is the holiest one and is believed that it never get dry. Galtaji Temple is famous for the many tribes of monkeys that lived in this area. It was built by Diwan Rao Kriparam, an attendant to Sawai Jai Singh II, in the 18th Century. You can also visit the Krishna Temple, Surya Temple, Balaji Temple, Sita Ram Temple and Sisodia Rani Ka Bagh situated near Galtaji Temple. Amber Fort is one of the places to visit in Jaipur. The Fort is just 11 kilometers from Jaipur located high on a hill is one of the most famous forts of Rajasthan. 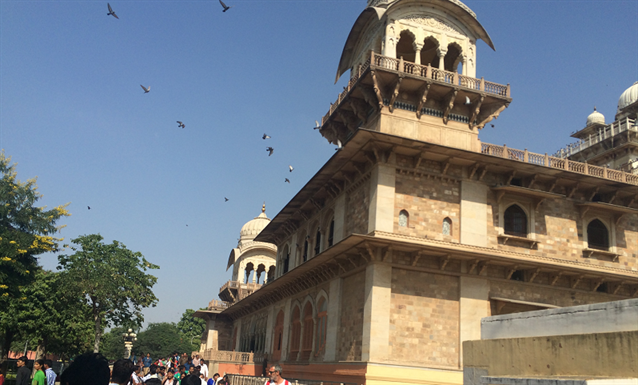 It was built in 1592 by Raja Man Singh and popularly known as the Amer Palace. 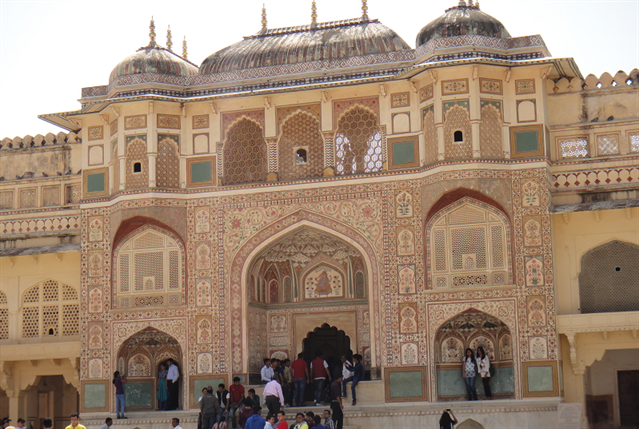 The Amer Fort is a blend of both Hindu and Muslim architecture. 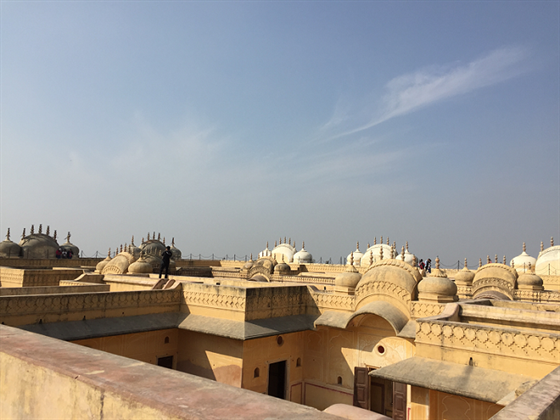 It consists of the Diwan-e-Aam, Diwan-e-Khas, Sheesh Mahal and the Sukh Niwas where a cool climate is artificially created by winds that blow over a Maota Lake within the palace. 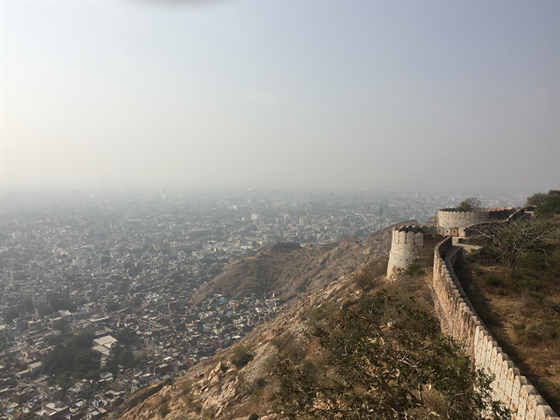 Jaigarh Fort is built by Sawan Jai Singh II in the early 18th is surrounded by huge battlements and connected with Amer palace with subterranean passages. It is built to protect the royal family living in Amber fort during hard times. The Jaigarh Fort architecture is almost similar to the Amer Fort, and it offers a panoramic view of the Jaipur city. 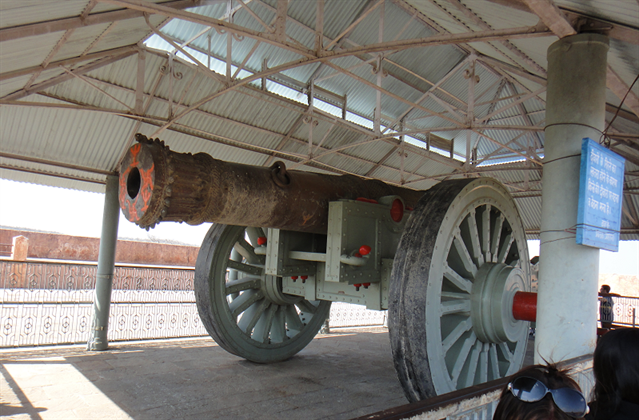 One can see the world's largest cannon on wheels, an amazing palace complex and the assembly hall of the warriors (Shubhat Niwas) along with a museum and an armory at Jaigarh fort. It is said that once there was a huge treasure buried under the fort which was seized by Rajasthan government in the 1970s. The Jaigarh Fort was built to protect Jaipur City and the Amer fort from enemies and rivals. Built by Maharaja Sawai Jai Singh II in 1734 is originally named as Sudarshangarh Fort. Later it was given a new name, Nahargarh means 'abode of tigers'. Nahargarh Fort has extended wall which connects it to the Jaigarh Fort. It is made on the basis of the Indo-European architecture and there are many structures inside the fort. There is temple inside the fort which is dedicated to the Rathore prince, Nahar Singh Bhomia. Madhavendra Bhawan inside the fort is divided into nine similar apartments built by Sawai Madho Singh for his nine wives. Jantar Mantar in Jaipur is considered to be the largest of the five observatories and also houses the world's largest sundial. It was built during the kingdom of Maharaja Jai Singh II during the 1720's. It consists of fourteen major devices for measuring time, tracking constellations and, even for, observing the orbits around the sun. Samrat Yantra (the world's largest sundial), the 'Hindu Chhatri', the 'Jaiprakash Yantra' are some of the most famous geometric structures inside the Jaipur Jantar Mantar. Jal Mahal or water Palace is one of the most beautiful constructions in Jaipur. It is located in the middle of the Man Sagar Lake in Jaipur city renovated and enlarged in the 18th century by Maharaja Jai Singh II of Amber. Visitors has to take boats or gondolas to reach the Jal Mahal earlier but these rides stopped 3 years ago because of the rise in water pollution and to protect the monument. However, you can enjoy small market stalls and camel rides else nothing much to do at the Jal Mahal these days. Jaipur Zoo was opened in 1877 is located near to the Albert Hall Museum. It is divided into two parts one for mammals and other for birds and reptiles. 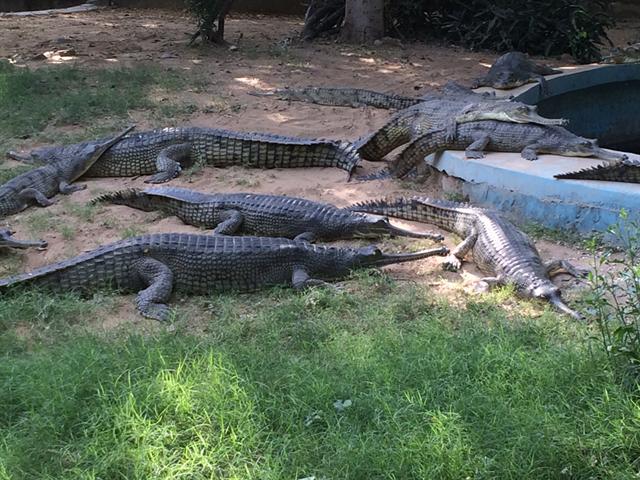 There is a museum inside the zoo which exhibits the wildlife of Rajasthan. Albert Hall Museum is the oldest museum of the Jaipur situated in Ram Niwas Garden outside the city wall opposite new gate. Albert Hall Museum is a fine example of Indo-Saracenic architecture designed by Sir Samuel Swinton Jacob opened as the public museum in 1887. The museum has a rich collection of artifacts like paintings, carpets, ivory, stone, metal sculptures, colorful crystal works, and lots more other attractions. Snow planet is a newly opened fun zone in Malviya Nagar, Jaipur is spread in the area of 8000 sqm. ft filled with natural Snow with the state of the art infrastructure and amazing ambiance. 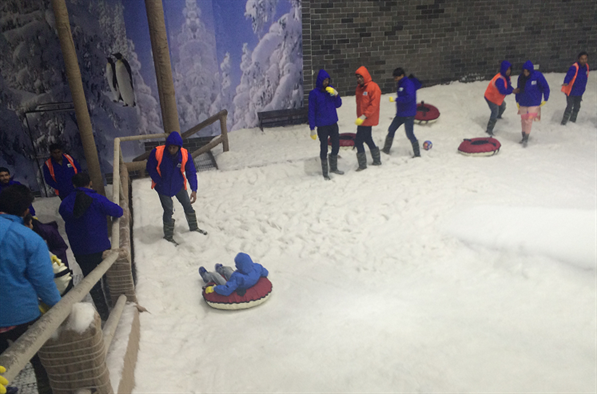 One can enjoy many Snow activities like Snow slides, Snow play area, Snow dance floor, London Bridge, live Snowfall and lots more inside the Snow planet. It is also a must have the place to visit when you are in Jaipur. 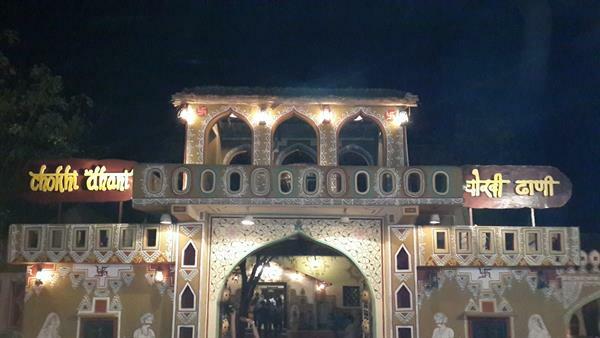 Chokhi Dhani is the most happening place in Jaipur to enjoy the rich heritage, culture, and awesome Rajasthani cuisine. The moment you entered in Chokhi Dhani it feels you are in some Rajasthani village. It is located 20km south of Jaipur, a fun place to take the kids. There are many interesting places to see near Jaipur cities such as Neemrana Fort Palace, Abhaneri, Sanganer, Ramgarh, Ranthambore National Park, Bairath, Sariska National Park and Tonk etc. One can visit Ajmer Sharif Dargah just 2-hour drive from Jaipur and Pushkar temple also. Jaipur is well connected to almost every corner of India via air, rail, and road. By Air- Nearest airport is Jaipur International Airport situated at Sanganer which is 7 km (domestic terminal) and 10 km (international terminal) away from the main city. It has the facility of daily domestic flights to almost all major cities of India like Delhi, Hyderabad, Goa, Kolkata, Chennai, Ahmedabad, Mumbai, Bangalore, Indore and Pune and facility of international flights to Sharjah, Muscat, and Dubai. One can also take the flights to Singapore and Bangkok via Delhi. You can also avail the chartered service to London and Dublin. Hire a taxi or any other local transport from the airport to reach the main city. By Train- One can easily reach to Jaipur via train as many trains connect this city to Delhi, Mumbai, Agra, Alwar, Jodhpur, Alwar, Kota, Udaipur, Jammu, Bikaner, Kolkata, Ludhiana, Pathankot, Haridwar, Indore, Gwalior, Bhopal, Roorkee, and Kanpur. There are three main railway junctions- Jaipur, the main station, Gandhinagar, and Durgapara. Take an auto-rickshaw, bus or hire a taxi to reach the destination within the city. By Road- Jaipur is connected with major cities of India through the National Highways 8, 11 and 12 to name a few. You can hire Rajasthan State Road Transport Corporation (RSRTC) buses between Jaipur and Delhi which runs at about every half an hour to and from both sides. Private taxi and other road transport means can also be used to reach Jaipur. Jaipur is also connected to Mumbai via Ajmer, Ahmedabad, Udaipur and Vadodara and is also well linked to Agra via bus. Being a popular tourist destination Jaipur has lots of hotels and resorts. Many forts and palaces are also converted into the hotel by their owners to welcome the guests in Rajasthani style. One can select any of the hotel or resort according to their budget and taste but it's always good to book your accommodation in advance especially during the season time. Enjoy mouthwatering Rajasthani cuisine, visit local markets, shop for beautiful handicrafts, Rajasthani clothes and bangles and lots more activities in Jaipur to make your trip memorable. I am a regular visitor of this blog. I Loved reading this blog it is very interesting and attractive. This Jaipur travel guide gives all the valuable information on local tourist attractions and accommodation in Jaipur. Thanks for sharing. There are lots of tourism places to visit in India. Taj Mahal, Jammu and Kashmir, Forts in Rajasthan, Palace in Jaipur, Ajantha and Ellora Caves, Chowpathy Beach, Golden Temple, etc. The list is endless. Find more discussion on best tourist place in India at http://QuestionSignal.com . Nice information, Thank you for sharing the information with us. Read your blog and found it really interesting. It gives me a really quick positive idea of Jaipur. Your information which you've shared here on your blog will really help us to explore Jaipur very well. Thanks for sharing really awesome information.